The perennial question answered – What is the Right Haircut for Your Face Shape? When it comes to your clothing, fit is everything. A good tailor possesses the power to make you appear slimmer, more muscular and even taller with just a short time spent behind the sewing machine. But he or she isn’t the only person you should be making friends with for these reasons. Your local barber boasts a similar set of skills. Skills that when implemented with the same consideration to the shape of your face as a tailor would pay to the shape of your body, can work wonders overall. So, just as you wouldn’t dream of wearing an ill-fitting jacket, nor should you sport an ill-fitting haircut. Instead, delve into Ape’s guide to picking the right haircut for your face shape, select a suitable hairstyle and watch in awe as your barber trims years off your appearance. Naturally, the first step in finding the perfect tonsorial accompaniment for your face is to establish exactly what shape of face you possess. However, before you can do that you’ll need to be aware of the six key categories in order to best assess where you fall. Your face is slightly longer up and down than it is wide. The jaw is slightly narrower than the forehead and tapers down towards the chin. Lines are fairly soft, as opposed to being harsh and angular. The vertical and horizontal ratios of your face are almost identical and the sides curve out slightly as opposed to being straight. Boasting a very masculine appearance, your jawline is pronounced and striking. In contrast to a round face, the sides are rather straight and there is less of a taper moving down towards the chin. The difference in width between the top and bottom of your face is quite significant. Your forehead is quite prominent, tapering down into a slightly pointed chin. If you spend a large portion of your time fending off ‘why the long face’ jibes this could well be you. Your face is drawn out and slim with straight sides and little difference in width from top to bottom. Like the oval face shape, your cheekbones are the widest part of your face. However, unlike an oval, your bone structure is quite pointed and angular, with a narrow forehead and a narrow chin. If you’re going to do something, you might as well do it properly. So, before you go drawing various shapes on your bathroom mirror with toothpaste and seeing which one your face fits into best, try this tested method first. Using a soft tape measure, measure across the widest part of your forehead, and from cheekbone to cheekbone. Jot the results down. Then, take the tape and measure from your hairline, down the middle of your face to your chin. Make a note of this too. Now, compare the first two results – the widest of which should be considered the width of your face. You can then use the length measurement, combined with the width, to work out which of the above categories most closely resembles your own face. Now that you’ve got all the information you need, it’s time to start thinking about a style to suit. The aim is to use your hair to balance out the proportions of your face in a way that looks natural and subtle. So before you get too comfortable in the barber’s chair, take a moment to browse the suggestions below and consider what sort of cut might work best for you. If you’ve determined your face to be oval shaped, congratulations – you’ve been blessed with what many would consider the holy grail of bone structures. As a result of this, you can happily wear almost any style you choose and it’ll look great. That said, there are still a few things to be wary of. Adding too much height still isn’t a good idea; the length and width of your face are already well balanced so opting for this sort of cut could throw things out of whack. Short, cropped styles will suit this face shape particularly well. If you’re stuck for inspiration, a timeless trim like a military crew cut or French crop is a very good place to start. Wide cheeks and soft lines can work together to create a babyish look, which funnily enough doesn’t tend to be top of most men’s wish lists when it comes to aesthetic traits. In order to combat this, your most powerful weapon is height. Opting for a style with some added lift can work to elongate the face – think a pompadour, quiff or messy, textured cut on top. The latter is particularly good for those which also have thinning hair or a receding hairline. Cropping the sides short can also make the head appear slimmer and take some of the roundness out of the cheeks. Ask your barber for a taper or fade on the back and sides, depending on how short you want to go. That strong, angular jawline is no doubt one of your proudest features. But combined with the uniform width of your cheekbones and forehead, it can be quite a harsh overall look. This is why your haircut should aim to soften the lines and round things off nicely. Not too much, mind. Try a messy, mid-length style to frame the face and counterbalance the wideness of the jaw. If that doesn’t appeal and you like the idea of something more masculine then shorter options can work well too. Try an Ivy league cut with a close fade on the sides and team it with some short stubble to reduce the angular nature of your jaw. Widest at the temples and tapering down to a point at the chin, heart-shaped faces aren’t the most common but can still be catered for with some clever barbering. Steer clear of very short, buzzed or tapered haircuts, which will only accentuate the width of the forehead. Instead, opt for a mid-length style with a pompadour or some side-swept length to add a touch of height and make the temples appear narrower. Experimenting with facial hair of some description is also a great idea as it can help to fill out the jaw and reduce the pointed look of the chin. Try a short, boxed beard or even a slightly longer style if it’s in keeping with your personal style. When the face is naturally long it’s important not to add any additional length to it with your hair. Stay away from haircuts with very short sides and also of anything that creates too much height on top. Instead, ask your barber for a style that leaves enough length on top to play with while still staying relatively close to the head. A side-swept crew cut, an Ivy League hairstyle or slick-back can accomplish this. When considering facial hair, it’s important to remember that the goal is to reduce length, not add to it. For this reason, long beards are best avoided and a short style or even just a smattering of stubble will help to elevate your look. Narrow at the brow and chin, with the bulk of the width in the cheekbones, diamond-shaped faces can be tricky to cater for. Goal number one is to add width to the forehead, which can be done with either a fringed cut or a brushed-back style that leaves the brow fully exposed. Facial hair can be used to create a similar effect south of the cheekbones, where a short, well-groomed beard will help to fill out the bottom of the face. Found the cut that perfectly frames your face? Your next step is to decide which hair products you should be using. *Illustrations produced in house by Ape to Gentleman – republishing is not permitted unless credited and linked. 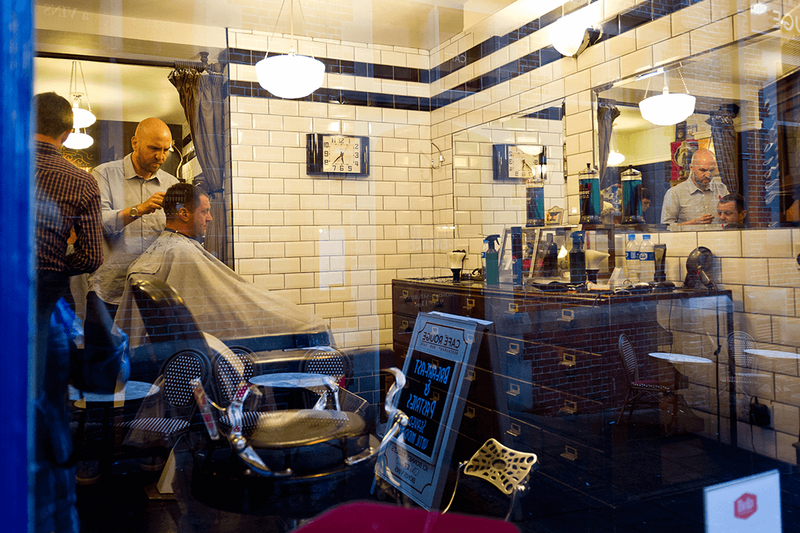 Paddy Maddison is a renowned mens style and male grooming expert based in the UK. His finger is firmly on the pulse of the latest trends and fashion but with one eye on classic style.